Action movies are supposed to be implausible. The action is meant to be superhuman — more violent, more outrageous, more daring and impossible than the last. They are not, then, in my opinion, necessarily good stories. They can be entertaining — with explosions, scene cuts and new sights — but I don’t look for an action movie to tell a compelling story. Recently, I saw Unstoppable, the new Denzel Washington movie. The promotion around the movie certainly had an action element to it, but the trailer and Washington’s past roles triggered to me a belief there might be something a bit more provocative to the movie. There wasn’t. I didn’t particularly like the film, though I suppose I didn’t hate it, but it did make me think about what makes good writing and, really, helps make good journalism and what Unstoppable didn’t have elements of either. 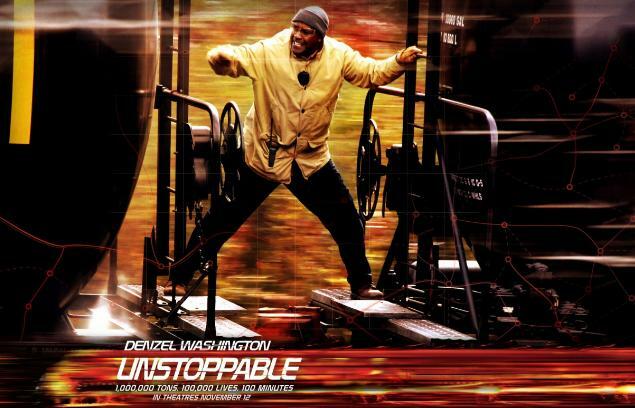 Unstoppable, a film about an unmanned train heading toward a large community, has its marketing wrong. It bills itself as having been inspired by a true story. That is true, it turns out, but while creative license is expected and it remains true enough to the heart of the story to be ‘inspired by it,’ it comes into action movie territory with a degree of implausibility and disinterest toward detail and development that I can’t say it’ll be a memorable film for me. It’s not authentic — The most compelling fiction blurs the lines of reality and fantasy, right? So how come a movie based on actual events that were damn compelling on their own comes off as seeming so damn contrived? The movie starts in ‘Southern Pennsylvania,’ which isn’t a real place at all, but rather exactly what I’d picture someone who never picked up a phone to talk to someone from central Pennsylvania would assume of a salt-of-the-earth, coal-enriched, blue collar, small town in the Keystone State. The Lesson: The details make the best writing and journalism, how people actually look, talk and live, not how you assume they do. It’s not complex — I’ll point out that, again, this just might be a case that this film should have been marketed as a blow-up action movie, but because of its real-life roots and Washington as an acting force, I expected something more. Throughout this film, the antagonists are maniacally evil, the protagonists are endlessly good natured and only charmingly flawed, and everything else falls into place. (That runs into contrast with the excellent Social Network). The Lesson: The world tends to be far less simple than we want it to be, so challenge your audience with the nuance that makes decisions and drama hard. It’s point isn’t clear — I’m not entirely sure what, but as the critical Salon review also pointed out, it seemed some point is being made by incessant media coverage throughout the film. Perhaps it’s a new device to help tell the story, but it felt again like a point was being made, which further confused me as to whether I was watching an action movie or a thriller. Of course, the media coverage didn’t seem particularly on-point to be critical or satirical. The Lesson: If you’re going to have a point, make it clear quickly, or risk being tuned out. On the writing side of things, it’s easy to say ‘Be more compelling than an action film,’ but it’s a lesson itself to just be clear in what you’re trying to do. Getting something out quickly will be evaluated differently than something well researched, so convey what the audience should expect. (For example Roger Ebert, who seems to have been expecting an action movie, liked it for its ‘craftsmanship,‘ and, to be sure, the cinematography does keep it entertaining). ..Also, don’t waste our time by taking someone as talented as Denzel Washington and making such a flat movie.